This distinctive, handcrafted timepiece signals the passing of time with gentle, rich-sounding chimes – eight bells at 4, 8 and 12 o’clock to mark the end of a mariner’s four-hour watch, with one bell the first half-hour after, plus one additional bell with each subsequent half-hour. Behind its classic, hand-silvered dial, 364 precision brass parts and an 11-jewel movement, all of which are made in Chelsea, Massachusetts, ensure accuracy in time and enduring quality for years to come. Since the first patented Ship’s Bell left our factory in 1900, it has been held as the standard by which all other Chelsea clocks are measured. 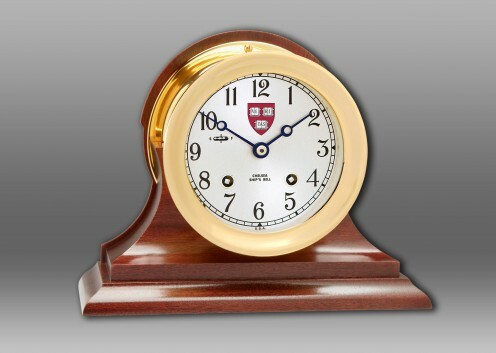 This Ship’s Bell clock features the Harvard Shield on the dial, a lacquered solid forged brass case, a hinged bezel, and a solid mahogany traditional base. Click on the slide show below to learn more about the Ship's Bell Mechanism. The Chelsea Ship's Bell, and many other Chelsea's clocks and Barometers, are crafted from rugged forged brass cases which are then hand polished and lacquered to last generations. Chelsea clocks and barometers are made of heavy solid brass forgings designed to last for generations. 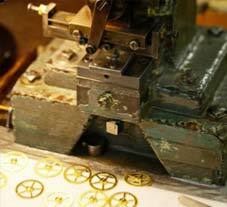 Chelsea uses more brass than any other clock manufacturer in the world. The 6" Ships Bell Clock for example, contains up to seven pounds of solid brass, most of which is the casing, forged (not cast) from a single chunk of metal to provide maximum protection from rust and corrosion. The high quality and volume of brass also accounts for the distinctive bell tone of the Ship's Bell Strike. 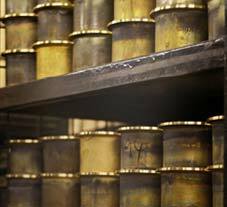 Select products are also offered in Nickel, where our solid brass forgings are expertly plated for a modern metallic finish. 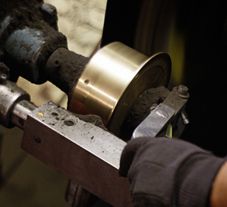 The rough machined cases are then sent to the buffing room, where they undergo three separate polishing and buffing steps to bring out their mirror like finish. 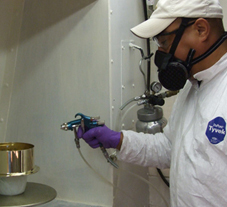 The hand administered buffing technique is a lengthy process requiring tremendous skill and just the right amount of pressure to bring out its full luster, as well as avoid markings or too dull a finish. Next the case is sent to the lacquering room, where a clear finish is applied by hand to further protect the case against corrosion. With normal care and cleaning, the case's tarnish resistant and illustrious appearance will last for generations. Once polished and lacquered, each case is machined and drilled to accept a variety of different clock and barometer models. The dial starts as a brass piece, which is then spun on a potter's-type wheel, where a special compound is administered by hand to ultimately create a beautifully silvered dial that will last for generations. The dial's numerals are deeply etched (not painted) and lacquered for added durability and aesthetics. 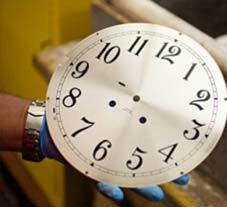 Each dial must undergo rigorous inspection before passing our quality control standards. 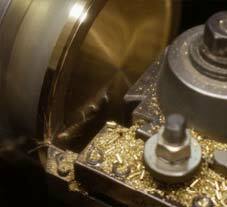 In addition to the dial and case, there are hundreds of handcrafted parts that go into a Chelsea. 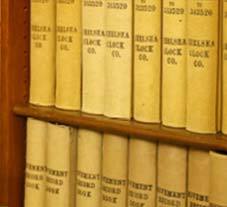 Many of the methods used to craft these parts remain unchanged over the years since the company's founding in 1897. Custom machinery was especially designed and built by the company to manufacture our own precision parts, from bushings to wheels. For better accuracy, for instance, Chelsea cuts rather than stamps all of its gears. A Ships Bell is a unique American clock in that its parts are manufactured on-site, in Chelsea MA. The movement's 364 parts, including gold plated brass gears, hardened steel pinions, and jeweled bearings are hand assembled. Mainsprings are hand wound, and the finished pieces are balanced and calibrated. In total the manufacturing and assembly of a Ships Bell requires hundreds of hand operations over a period of 6 weeks. 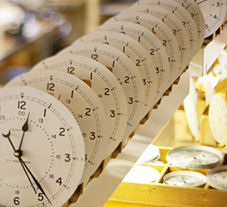 Our master clock makers take extra care to ensure each instrument, both clocks and barometers, function perfectly. Each movement is inspected and accuracy-tested for a full seven days. Once it is put into the case, the whole unit is again tested for an additional seven days. Chelsea offers world class personalization services, allowing for our customers to order a uniquely customized gift to celebrate important milestones and achievements. 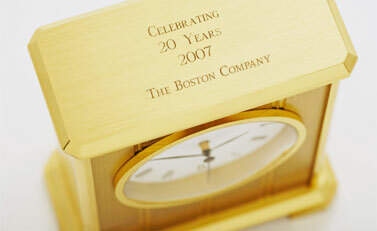 Personalization options include engraving directly on the case or screen printing logos directly on the clock dial. 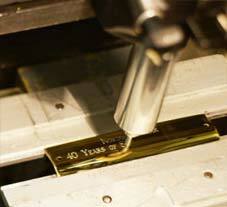 Here our engraving machine is shown inscribing a message on a brass plate. Each Ships Bell is individually stamped with a serial number which is registered in Chelsea Clock log books before being shipped from the factory, a practice which dates back to 1897. Each entry identifies the store or customer it was first sold to, the date it was sold, and what, if any service work was performed. So, if a Chelsea comes back for service, we know its history and can guarantee any repair work. Mariners have used a unique bell code to tell time at sea for hundreds of years. The code is based on the crew's typical workday routine while the vessel is under way. A ship at sea requires constant attention throughout the day's twenty-four hours. The day is therefore divided into six four-hour periods, each called a "watch." Similarly, the crew is segmented into three divisions. Division members then stand their individually assigned duties on two watches per day, with eight hours off duty between watches. To rotate each division's watch times, the Evening Watch is periodically divided into two watches. These are called Dog Watches because they "dog" the watch schedule for all divisions ahead by one watch period. First Watch 8:00 p.m. to 12:00 a.m.
Mid-Watch (also Black Watch) 12:00 a.m. to 4:00 a.m. Morning Watch 4:00 a.m. to 8:00 a.m.
Forenoon Watch 8:00 a.m. to 12:00 p.m. Afternoon Watch 12:00 p.m. to 4:00 p.m.
Evening Watch 4:00 p.m. to 8:00 p.m. The watch officer struck the ship's bell every half hour to apprise the crew of the time. A single bell denoted the end of the first half hour and one bell was added each half-hour. Eight bells therefore signaled the end of each four-hour watch. Like centuries of seafarers, you'll soon know the time when the clock chimes, even if you cannot see it.